By Jerry Bradshaw, Tarheel Canine Training, Inc.
K9s and having dogs in general. effect the arrest might sue the arresting agency for injuries sustainedduring the arrest procedure. Whether the tool used is hands, a Taser, or a K9, the risk is there. In this article I hope to cover some of the issues that will help agencies think through the issues completely. fleeing capture, and even location of friendlies who may have become lost in the woods. Their amazing olfactory sense allows them to do this job quickly, efficiently and reliably. However to do this job properly, administrators must allow the unit to benefit from the best training, both initial training as well as maintenance training (16 hours a month is the minimum industry standard of training hours no matter what the dog is trained to do). from the productivity of this location device. Training is essential. Quality vendors are essential, and choosing motivated and dedicated handlers is essential to the success of a unit. As the number of dog teams in the K9 unit grows, proper supervision, and training must take place to keep the unit cohesive and functional. Regardless of the kind of K9 you choose, dual or single purpose, the majority of its use will be as a location tool. is required to effect pain compliance allowing officers to safely arrest the subject, the more physical damage will result. Even with proper targeting training, grip training to keep the dog’s apprehension stable for a proper bite and hold, and efficient handling, a dog bite will cause some damage. 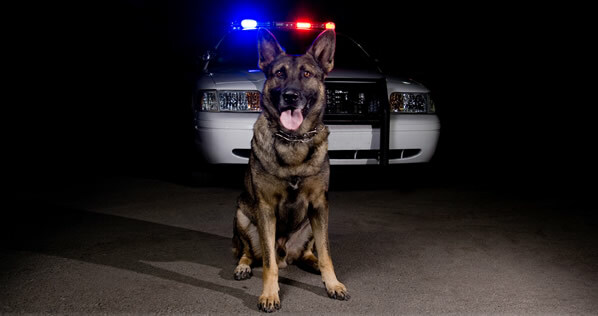 However, as patrol case law has held for many years, the use of properly trained K9s to locate and apprehend fleeing, unsearched felony subjects provides as much safety to the suspect being apprehended as to the officers involved in apprehending them, and without a K9 the result to the subject can be far worse than a dog bite. In many cases the agency would be avoiding a wrongful death lawsuit for a dog bite lawsuit, as the officers having to do a buildingsearch in the dark without a K9 must have deadly force at the ready in doing so, thus increasing the likelihood that it will ultimately be used. K9s save the lives of a lot of subjects not wanting to go to jail, who are willing to resist. many cases the presence of a K9 has a deescalating effect on a suspect, as humans have a visceral reaction to the thought of getting bit by an animal, and in particular a dog. purpose dogs in rural areas may not have a security officer (while not recommended, it is a reality of police work) to run their tracks with them, however the dog has the capability to make an apprehension and assist in the process of bringing the subject into the control, careand custody of the officer. Further the presence of the dog is likely to encourage the subject to more willingly give up as while they may be willing to go “hands on” in a fight with the officers they are less inclined to try out the dog. security officer are the dog’s protection. the dog brings your officers to danger, the dog himself is an immeasurable asset for effecting the apprehension, or deescalating the situation, and allowing a safer arrest for all involved. If you decide to run a tracking dog without apprehension capability, security teams going with the dog are an absolute necessity. team (depending on the situation, and the topic of another discussion). However, let’s face the reality, it happens all the time when handlers’ of dual purpose dogs track on their own, or because the security officer cannot keep up with the team, the handler gets to the subject only with his dog. Tracking is the single most dangerous function of a canine team. The moving team is often operating without cover or concealment, both of which are enjoyed by the subject being sought. Good decisions must be used if a single purpose dog is used to track a felony subject, employing proper back-up and proper training of these backup officers to function with the dog. One of the reasons to employ a K9 team is for efficiency. Less manpower to do a given job. Most tracking situations aren’t SWAT tracking calls, but they are dangerous and risky nonetheless. The dual purpose K9 not only provides the apprehension function on tracks, but offers this handler protection function during all manner of police-citizen encounters. 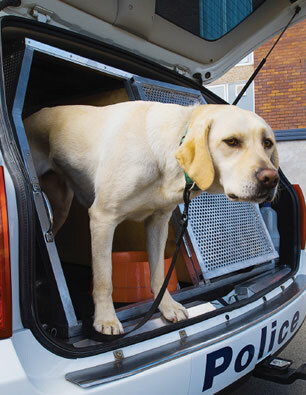 With a door popper, the dog can be brought out to the handler to assist in many potential life threatening situations. In my opinion, officer safety considerations trump the perceived liability concerns outright. keeping efficiency of usage up and liability exposure minimized. training to practice for routine and high risk encounters. friendly, if it is frightened or tormented to bite and inflict damage. and other hunting breeds can often make great single purpose dogs. temperament and drives without a pre-conception. Pinchers or a Rottweiler, put these ideas out of your mind. No serious vendor sells or trains for police work anything other than the GSD or Malinois or crosses for dual purpose work. These dogs have the availability, drive, temperament and clear headedness for the work. for the controlled aggression. You do not want a single purpose dog with the genetic ability and predisposition for aggression as a single purpose dog. That would mean the dog has the ability but you failed to do the training to assure the dog is under control of the officer for its aggression. If you choose a dual purpose dog, however, there is no question that the dog has been trained to do the work and the control work has been trained, tested and certified. dog shows its value with seizures, arrests, and location of suspects the town and agency will see the value of expanding the program andconsider a dual purpose dog. Do what it takes to get the program off the ground and then revisit the question of single v. dual purpose. Enhanced officer safety, suspect safety, and likely de-escalation of situations by the mere threat of the dog will be noticed once the dog is employed in its full measure. Until then, get a program off the ground any way you can. K9 programs build community support, enhance community safety, increase the efficiency of all aspects of patrol work, and save time and resources.